Collect the all orders and reach 5000 points to complete the level. This level is little easily and you need to break 25 yellow and purple candies and this level board have 27 meringue blocks and 9 chocolates. 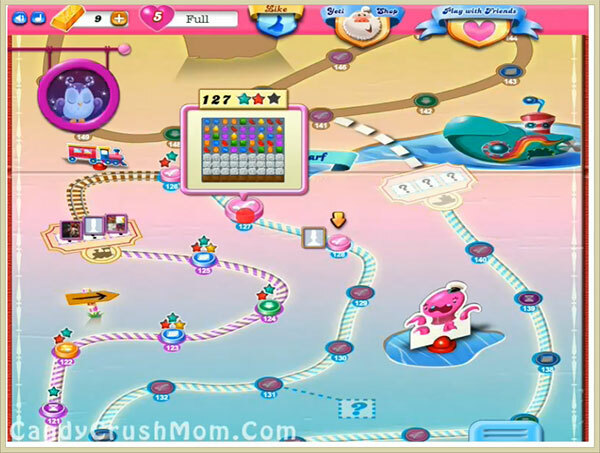 To complete this level you should try to play and break more yellow and purple candies and combine these candies with special candy to reach requirement fast. As you chocolates start to increase then play from bottom to reduce wastage of moves. We completed level with 49280 score by play more from purple and yellow candies and combine them with special candies and reach requirement within 17 moves and rest 8 moves converted to striped candy that help to get three star score. I am on this level right now but the screen looks different. I have been stuck on this level for a while now. On my screen it says to collect 20 red, 90 blue and it shows a green candy but does ot says how many. I have hit the target # of points several times but have yet to complete the level. Why is it that you show a different level and number and colour of candies? Hey Ajne< have u found a solution for this level I'm stuck on it too! 20 red, 90 blue little whirling flying saucers but I can't get passed this stage . Any helpful suggestions??? Same…why no help for this? Amy were you able to get help? My screen is the same as yours and I cant get by this freakin stage!! I have the same one and I’ve been stuck for a while. Did you have any luck with yours? It would be so nice to get off this stupid board. I’m having the same problems as others mine has the traveling track also. I can find no help for this level. I would like to know what sets off the flying saucers, and how to beat this level.